Is there a way to force google maps to not use dsta when data is turned on? One way is to restrict data usage in the Settings menu.. I can select and download a map, but I then cannot open or access that map. I get to the same screen as shown on the left at the bottom of this web page. I followed the steps that “parayil Hussain” listed four months ago: wireless off, mobile data off, used GPS app to confirm that GPS connected and then opened Google Maps (latest version), selected Offline Areas. But all I get is the postage stamp size map that I can Delete or Update. Is there a setting somewhere that is wrong? I have a Samsung Galaxy S4, thanks. You don't use the map via that screen - use Google Maps as normal. Any area NOT downloaded will be shown but with no (or very little ) detail. You will only have normal Google Maps high detail within the area(s) you have downloaded. Thanks, it drove me batty trying to figure that out. None of the guides mention that particularly relevant aspect. What does that have to do with maps? how do you download a route for offline use later? The download will be 225 Mb and I have 55 Gb free on my Note 5. Google's answer is "this area is not available offline "
So, I presume that among limitations there are some not relating to technical possibilities. Like advertising money for example. No problem : I'll stay with Here, former from Nokia, which "offers" entire offline Thailand map, among a lot of other maps, for free and works better than Maps in my island because Koh Phangan is too small to benefit from frequent Google's updates. B.T.W, Google downloads are not well optimized because the estimated size of Phangan's download is 225 Mb for 191 km². The entire Thailand's map on Here weights 483 Mb, for 555 000 km² ! While I often fire up Google on wifi, I use OSMAnd offline (good user interface improvements last fall in version 2.x). Maps have a learning curve, otherwise I'd have a look at Here. I don't think so that offline map will show current traffic status. Here map is not detailed as Google map,if comparing only ten %. Here map not says street name in all countries. Here map is not showing live traffic data in online for all countries. This is good info, but being offline when using Maps will prevent live traffic info from being provided. Maybe I'm just crazy, but live traffic info is the main reason I use Maps to begin with, most of the time. First of all check the " Google play services " and " Google play store " , and Google map is the latest versions,if not update all of these . Then open map >menu>setting>offline areas tap here and download the areas that you want to use. (Each areas maximum 120000sq/km)over WiFi and download and install this app" GPS status & tool box "also. When you want to use navigation switch off WiFi and mobile data if you want you can remove sim card also. First open gps status& tool box app look into circle see white colour dots changing into green as they are fixing your location this will take a few seconds or minutes, when it is fixed open Google map,the map will go automatically to the downloaded areas and opens, then see a small circle in bottom right corner of the map tap on this your present location will be fixed then go to search options and tap on the navigation button , you are able to get turn by turn navigation ,voice guidance, rerouting in offline using of Google map but live traffic. Data, and multiple rout options and lane guidance is not available in offline Google map. Yes it will, you need to just turn on GPS. It cant give you the exact estimate of time since live traffic information wont be available. Open Google map on data or WiFi search rout it may be 100 or 500 km and start navigation, now switch off data and WiFi you will get the entire rout navigation with turn by turn and voice guidance, if you deviate from the selected rout ,from the point of deviation will not get these features, there will not be rerouting with out net connection ,if you come back any way in to selected rout again will get the features. With out net connection Google map will not "rerout" but in off-line map it is limited to 50 km .it is said that Google has removed this limitation for some countries. Thanks for confirming some of my observations. Google Maps finally updated yesterday (Nov 10) making it possible to download a city, county or even an entire country by simply searching for it and then tapping a new download link (or by going to "Offline Areas" in the Google Maps menu and tapping on the “+” button). I'm still waiting for the OTA update. Hope it will be available soon. I just tested Google Maps offline with turn-by-turn navigation and dynamic rerouting. I have no Wi-Fi or cellular connection in my car. Everything worked well, completely offline. Well, almost completely. I have a Wi-Fi only Nexus 7 (2012). Before leaving the house I used a Wi-Fi connection to setup a route in Google Maps. Then I got in the car and started driving. To my surprise it worked! I'm guessing the online setup had the effect of downloading and/or caching the route for offline use, but I really don't know how or why it works. It seems to be similar to sending a route from Google Maps on a PC with the "send to device" (to a cellphone or tablet); but in my experience "send to device" does not let you choose a particular route. For my purposes, this is all I need because I travel locally to different spots in the SF Bay Area. It may also work in remote areas, outside of 50 x 50 meters limit for caching, but I haven't tested that yet. Would appreciate if others would test and comment, or just comment. Maybe Google's promise of offline maps is already here? Thank you for the article. I find Google Maps Offline Maps very useful. I think the next step would be to allow offline navigation or offline route or offline directions. My use case is this one : I am used to build a specific route on my computer on maps.google.com by creating way-points, which is easy to do by dragging the route to the point. Once it is done, I share it on Google Plus. Then I temporary connect my phone to the network and open Google Plus application and open the link I shared. The route is displayed in Google Maps application. I then can save the related map as Offline Maps but I cannot save the route. Using any other application does not fill the gap as they do not provide the ability to easily build a route on a computer, as far as I know. Tell me if you build routes for offline use with any other software/application. The best offline map I have used. Only for a few selected cities, otherwise says "Area Unavailable". I think you can do the same by selecting a location (city, cathedral, whatever) that has additional information (photos, opening hours, etc). Yes, this is the information I am looking for. Google Maps are very important especially of you are always on the go. Nokia Here Maps App is the best real-time offline Maps App. Offline Google Maps is a joke and an embarrassment to Google. As the author stated, no offline navigation is possible. What savvy people do is download OmAnd which gives you offline navigation for free. I used it for getting to offbeat places in Aruba and it worked great. The first ten download of maps are free. I got the message 'area unavalaible' at the top of my screen after I type 'ok maps'. I'm using maps version 9.0.0. I hope an admin will help me out with this one! Why do I have this problem? Why won't google maps let me save a map with a higher resolution ? I can't help you with this problem, but I can recommend that you use another app for offline use. it also supports offline search and navigation, along with information about many places. Google Maps is also the default GPS system for the new Android phone, making it an attractive, convenient alternative to the traditional GPS device. OsmAnd also does offline navigation and even search if I'm not mistaken. Sygic provides offline navigation if I am not wrong. You can try that. When we update an article, as I did here because the old article didn't make sense with the current Google Maps version, we are no longer creating a new post with a new title. This is so that the site doesn't end up with one up-to-date Maps article and a dozen other outdated ones. I use maps.me for offline maps, you can download full countries and it will take up just a little amount of space (China takes up only about 100MB of space). the app also supports offline navigation, but I use BE-ON-ROAD GPS navigation for that, it's a really good offline GPS, completely free. The maps take up a bigger space, though, and some countries have not been added yet. Google maps is an app that is used by millions of users across the world and are a preferred map app used by smartphone users. The features like dynamic re-routing, reporting of incidents and live traffic updates will benefit travelers largely. But none of those features are available offline. This looks like a tedious process to me. 1. Tap and hold the region you want to save. 2. It'll load and show an address or as 'Dropped pin'. 3. Now tap on the address and you get the option to save the map for offline use. 4. You can pan and resize the map as you like now and save it. How can we use these offline maps? 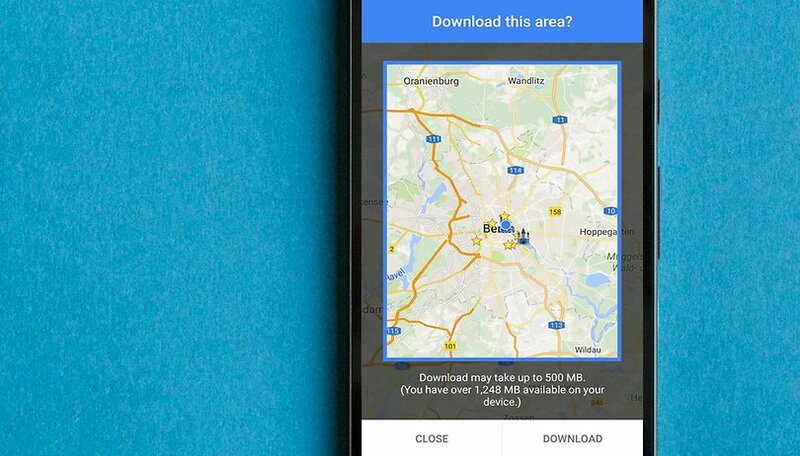 Can we navigate using these maps while offline?, Can we find something using these maps while offline?, I tried these things on Nexus 5 but seems not possible. is it? I was wondering, where is the map downloaded to? Can it be moved to Ext storage and used from there?